The Alan Stoudemire Award for Innovation and Excellence in C-L Psychiatry Education is given to an individual or individuals who has/have developed/led a creative educational program in the area of consultation-liaison psychiatry directed at any level, from medical students to board-certified physicians, that is outstanding by virtue of its innovation and impact. In keeping with Dr. Stoudemire’s legacy of interest in the training of medical students and psychiatry residents, applications are especially encouraged on behalf of programs geared to these two groups. Preference will also be given to programs which include educational materials which can be accessed and utilized by other institutions. Dr. Alan Stoudemire, from Emory University obituary. The award is named for Alan Stoudemire, MD, FACLP, a highly respected clinician and educator and a prolific author and editor. 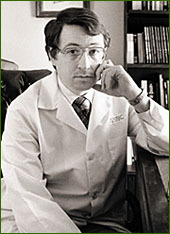 Dr. Stoudemire was professor of Psychiatry at Emory University in Atlanta, Georgia. He received the Academy’s highest honor, the Thomas P. Hackett Memorial Award, in 1997. For an excellent and inspiring read about Dr. Stoudemire, see A Tribute to Alan Stoudemire, MD 1951–2000 in the February 2001 issue of Psychosomatics by Troy L. Thompson II, MD, FACLP (Academy president 1991-92). 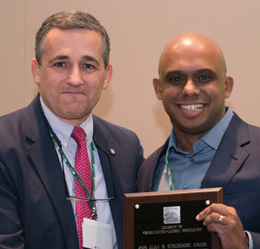 Leo Pozuelo, MD, MBA, FACLP, FACP, chair of the Fellowship & Awards Subcommittee, presented the 2018 Stoudemire award to Sanjeev Sockalingham, MD, MHPE, FACLP, FRCPC. 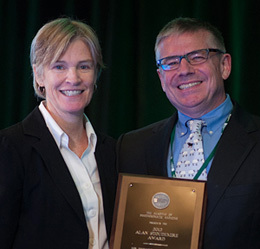 Guest presenter Sue Stoudemire, widow of Dr. Alan Stoudemire, with the recipient of the 2012 award, Gary J. Gala, MD, FACS, at the Annual Meeting in Atlanta, GA. Complete the online Stoudemire Award Nomination form. Two letters of support from individuals not directly involved in the program are required (training director, C-L director, beneficiaries, and colleagues from other departments are all appropriate), the comments from which should be focused on innovation and impact; submit letters of support online via the Stoudemire Award Referral form. All application materials must be received by April 1. The Fellowship & Awards Subcommittee will review all applications in collaboration with designated members of the Education Committee. A final decision will be announced by July 1. The award will be presented at the Academy’s annual meeting and the awardee(s) will have the opportunity to present their program as a poster during the poster session.